A tower block fire which killed six people in south-east London was caused by an electrical fault, according to initial tests. The blaze at Lakanal House, Camberwell, originated from a portable television at least 10 years old, police said. 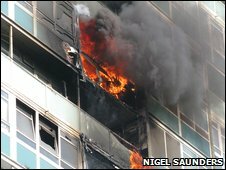 A report obtained by BBC London has suggested Southwark Council knew the tower block represented a fire risk. Among the victims of the fire on 3 July were a three-week old baby and two children, aged six and seven. The blaze also claimed the lives of Helen Udoaka, 34, Dayana Francisquini, 26, and Catherine Hickman, 31. Det Insp Rick Murphy said: "Initial results have found that the cause of the fire was an electrical fault originating in a portable TV set that was at least 10 years old. "The make and model of the TV set have not been confirmed so we will not speculate. It was in a room on the ninth floor." The fire, which was tackled by more than 100 firefighters, spread rapidly. It has since emerged that cladding within the walls of the 12-storey building may have contributed to the speed with which the blaze spread. BBC London has discovered that a Southwark Council report written in 1999 found Lakanal House had a "risk of localised fire spread between wall panelled sections". The block was due to be demolished under the council's Labour administration. But Labour councillors have told the BBC that when the council changed hands to the Liberal Democrats the new administration decided to keep Lakanal House. Southwark Council has refused to comment.